The U-87 MG CDX mouse model has been used extensively to test novel anti-angiogenic therapies in a preclinical model (e.g. zoptarelin doxorubicin). 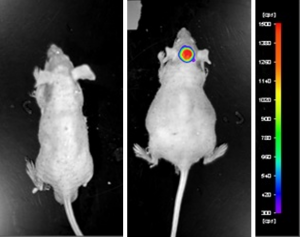 Also, creating stable expression of the luciferase gene in the U-87 MG cell line permits photon emission quantitation during in-life tumor growth in real-time. Monitoring luciferase expression enables quantitation of anti-tumor activity in response to monotherapies (e.g. COTI-2) or combination therapies (e.g. milciclib and temozolomide, or PI-103 and temozolomide).